Pure Silk Shawls and Scarves, hand painted wearable art. Brilliant Silk Scarves and Shawls are uniquely individual. The Brilliant dyes create a kaleidoscope of colour. Our range of pure silk includes shawls, square scarves and long scarves. 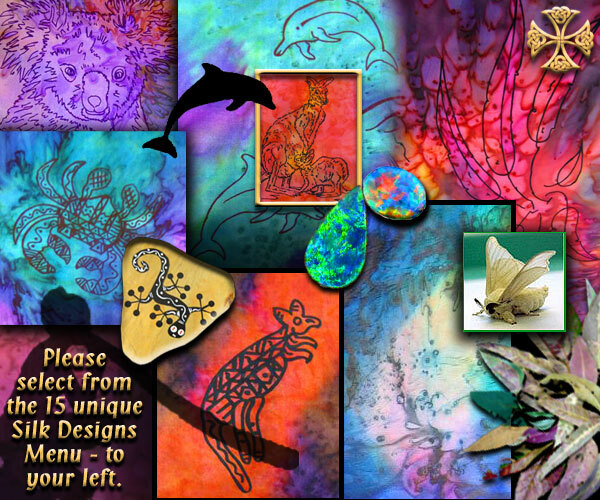 The range of designs are Australian Opals, Gum Leaf and Flowering Gum designs, Dolphins, Koalas, Kangaroos, Harps, Celtic and Aboriginal designs that feature the colours of the Australian Inland and the Great Southern Oceans. New Celtic designs will soon be on the menu, as well as pure Merino wool scarves and shawls, so fine and soft they feel as good against your skin as the silk.